When we heard through the grapevine that the Scottish Borders was finally getting a parkrun of it’s own, suffice to say we were excited. 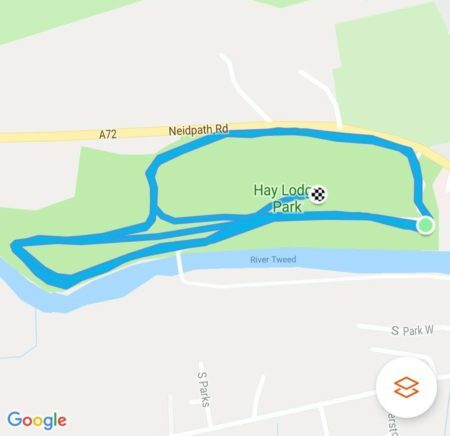 In *ahem* certain areas of Facebook you’re not supposed to discuss inaugural parkruns (well not without incurring the keyboard displeasure of the righteous) but as the event was already on the website did wonder just how much of a secret the Hay Lodge parkrun was. 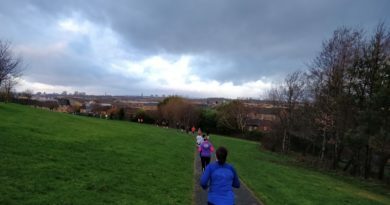 The run certainly wasn’t a secret to the 150 hardy souls who braved severe weather warnings and portents of apocalyptic rain. A goodly throng headed to Hay Lodge park for what we’ll probably insist on calling the Peebles parkrun. We grabbed a chat with race director Martin after he’d done his pre-run briefing. He told us how it had taken 3 years to get the thing up and running. Theres a lot to sort out, what with permissions and finance and whatnot. 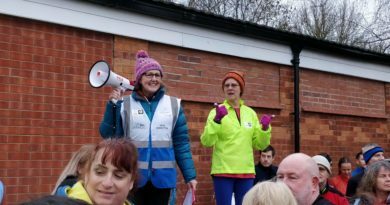 It’s down to the dedication of folk like this that the parkrun family continues to grow and the race directors and volunteers deserve all the credit they get. The running crowd was definitely one of the most varied we’ve seen. 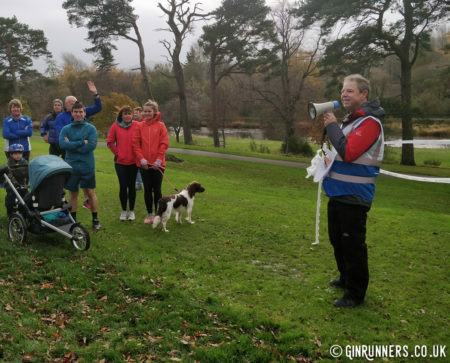 There were running clubs there to bag another inaugural, dedicated parkrun tourists (like us), the old, the young, parents with buggies, owners with dogs and a fair number of wee ones. 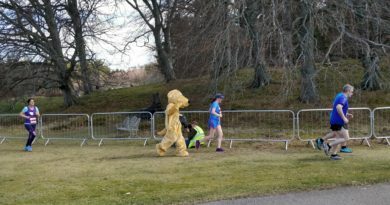 Obviously we were all first timers at this event, but there were also some parkrun novices giving it a try to see what the fuss was all about. 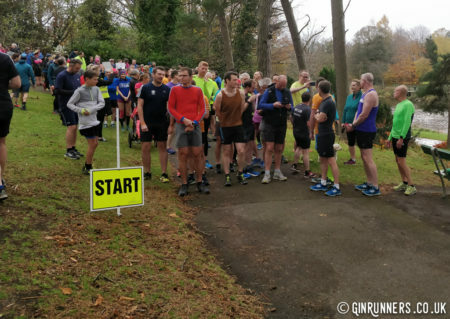 The run, unsurprisingly, takes place in Hay Lodge Park. The course is basically three laps with a couple of variations to get the distance right. We were told the course had been checked three times with a surveyors wheel… So they didn’t care what our Garmins said. Which is just as well, mine is virtually always short. The briefing warned us that the path through the park was fairly narrow, and implored everyone to play nice and the three lap format meant that overtaking was inevitable. By the time the leaders had caught the field on their third lap everyone was strung out enough for it not to be a problem. I’d decided to wear my trail shoes anyway, so taking to the grass was a viable passing option for me anyway. This was another of those “lap” courses where you encounter a nice long hill the first time around that you know you can look forward to another twice. The promised monsoon hadn’t arrived but it was a wee bit windy which made the uphill section of the course along the back wall of the park even more fun. It’s not actually that bad.. well not the first couple of times anyway. Hay Lodge is another course where the legs tell you it’s mostly uphill. It feels like a triangle. The first side is flat along the river. The next leg is the aforementioned long uphill. The third leg is a short, sharp downhill that takes you to the split… first two laps you go right, last lap you go left towards the finish. Ahh, yes, the finish. You leave the path for a short sprint (or trot, or waddle) up a grassy hill to collect your finishers token. After 5K it’s just what you want to see, the big finish wasn’t quite so big here but we made it up OK having thoroughly enjoyed the run. Hay Lodge is a welcome addition to the parkrun family. It’s one of those that you could easily do as part of a weekend away. Peebles is a pretty little town and the Scottish Borders are a beautiful part of the world so what’s not to love? Now that it’s up and running we really hope that it goes from strength to strength. Whether it’s locals who go every week or parkrun tourists ticking it off the list there’s a lot on offer here. Hay Lodge is a most welcome addition to the parkrun family. Spread the word. The Borders are on the parkrun map, and this one is well worth adding to your list.